I am having the best time watching "The Brink." It's a funny, clever, fast moving half hour of t.v. If you're not paying attention, you'll miss so many great lines. 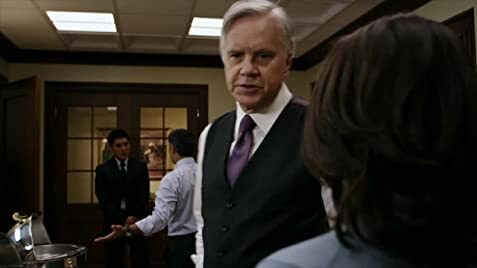 Tim Robbins is hysterical as Secretary of State. Reminds me of Charlie Wilson; womanizer, drinker, but smart as heck. Jack Black is not my favorite comedian but he is winning me over in this series. John Larrouquette plays the fanatical religious ambassador to perfection. Pablo Schreiber is a lovable screw up. I don't think of Esai Morales as a comedic actor but he plays comedy really well. I could go on and on about each character so I'll conclude with this. Each and everyone of their performances knocks it out of the park. I applaud the writers of this great show. If this series is not picked up for a second season, I'll be terribly disappointed. Even though he's credited as such, Jack Black revealed on an interview that his producer credit is something his manager asked for, but that he's not actually involved in the production side of the show. Vanessa: Oh, God. It's a bloody mess! They're going to lock us in a room and throw away the room. Jammer wears Naval aviator wings despite being a Naval flight officer, a completely different rating.